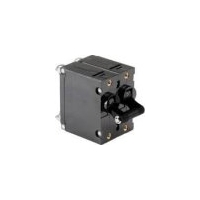 Designed for applications requiring higher amperage and voltage handling capability in a compact design. Protects wiring, motors, generators, batteries, etc. in a harsh marine environment. Fit common panel cutouts. UL 489A, UL 1077 recognized, VDE Certified, CE Marked, TVU certified. Size: 2"H x 1.84"D x 1.48"W.